Apple engineers have made contact with iPhone 4S users who have complained about experiencing short battery life on the new iPhone 4S. Some new iPhone buyers have seen a 10 per cent drop in battery life each hour, when the device is in standby mode, with Apple's guide suggesting it should last for 200 hours. Engineers for the company have reached out to those affected and attempted to install a diagnostics file in order to seek out the root of the issues. One user told the Guardian that the problem persisted even with Siri (suspected by some to be the culprit) and location features switched off. 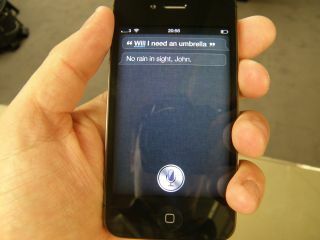 He wrote: "I switched off all the new features including Siri and location services, but it was still really poor. I also tried setting up a clean phone with no apps but it is still really poor. "I then got a call from a senior engineer who said he had read my post and was 'reaching out' to users for data and admitted this was an issue (and that they aren't close to finding a fix!) and asked lots of questions about my usage and then asked if he could install the file below and that he would call back the day after to retrieve the info." "I extracted the file from my Mac after a sync and emailed it to him. He was incredibly helpful and apologetic in the typical Apple way!" While some users have blamed the poor battery life on Siri, others believe it is due to corrupted contact files. However, it doesn't appear as though Apple is any closer to diagnosing, let alone fixing the issue at this stage. At least the company is on the case.